No guide to London’s most sought-after districts would be complete without taking a look at this capital’s centre of cool. An ever-popular spot for both locals and tourists alike, if you think we’ve missed any of the highlights then drop us a message using either Instagram or Facebook. This week we’re exploring Camden. Perched on the edge of London’s canal network, Camden has a rich and varied place in the capital’s history. It has since transformed into one of the most desirable areas to live, and is famed as much for its alternative culture as its enviable central location. Camden Town, Chalk Farm and Mornington Crescent tube stations all serve the area and numerous bus routes connect Camden with the nearby West End. This Camden restaurant is a meat lover’s paradise with its tender beef steaks served up on sizzling hot slates. The authentic food is excellent and the restaurant’s approach is informal and feels like a cosy Mediterranean barrio rather than a pretentious steakhouse. Vegetarians are also well catered for and it’s worth a visit for the wine list alone. Sourced from Mendoza in Argentina, you can sample spectacular inky red wines to accompany the exceptional food. If Cajun comfort food sounds like an alluring supper choice then look no further than The Blues Kitchen. The deliciously succulent burgers are served up alongside crispy fried chicken, jambalaya and buffalo wings. During the day, casual vibes prevail but come evening, the cocktails flow and things turn distinctly more adult. They are also purported to have London’s largest whisky collection. Located just south of the canal is Poppies, Camden’s lauded fish and chip mecca. You can opt to take away but it’s best to dine in for the full experience. The retro décor is wonderfully nostalgic but the ethics are a far cry from the 1970’s interior with a fully sustainable fishing policy so you can tuck in guilt free. This clandestine speakeasy is populated with young professionals and couples seeking retro vibes in the heart of Camden. The innovative concept requires guests to pay a fee on entry and bring an unopened bottle of booze. The skilled mixologists will then create cocktails to your specifications using an array of syrups, soft drinks, liqueurs and other additional ingredients. This long-standing Camden drinking hole is a perennial favourite with locals. Eschewing the more polished and refined approach which prevails of much of Camden, the excellent grub and friendly clientele offer something of a lost era of the local pub. The crowd is mixed, but always welcoming, and it’s the perfect spot to escape the fashionable alternatives and relive the 90s in all its wonderful British glory. With its premier High Street location, The Camden Head is the perfect spot for a post-work pint or a weekend tipple. Famed for being one of the oldest pubs in the district, the upstairs boasts a small theatre where you can catch comedy acts and local amateur dramatic productions. The extensive drinks list and a solid selection of food make it a neighbourhood staple oozing with character and a popular meeting spot for the locals of Camden. 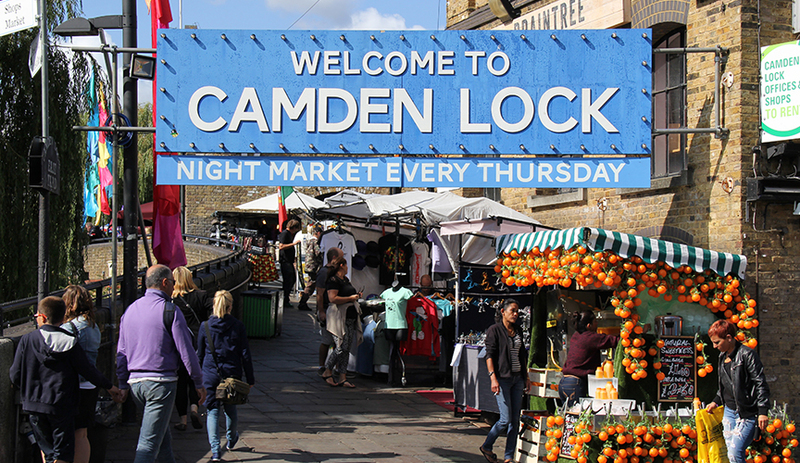 Camden Market prevails as one of the capital’s most alluring and diverse locations, boasting shops, restaurants, bars and stalls. The markets span several locations, the most popular of which are the Pickford Stables and the iconic lock. It’s the perfect place to shop for one of a kind gifts and trinkets from independent local traders. Since its birth as an Irish ballroom in the 1930s, the Electric Ballroom has had many incarnations, the latest of which is a striking 1,500 capacity entertainment venue. When not playing host to some of the world’s most iconic rock bands, it reigns as one of Camden’s most sought-after clubbing destinations. Located in a historic railway shed, The Roundhouse has been redeveloped into one of London’s most diverse and venerated music venues. This official World Heritage Site is also a multimedia studio space and now a protected venue for locals to enjoy for many decades to come. Looking for home in this corner of London? Get in touch with our Camden branch today.